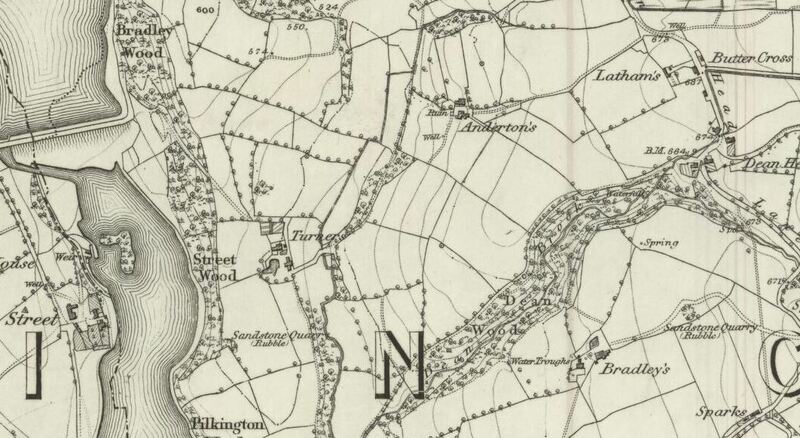 On 20th October, 1860, the Bolton Chronicle reported the sale of farming stock, equipment and furniture at Latham’s Farm, Dean Head Lane, Rivington, by William Barlow. Then in the July of 1862, the site was to be let by Ticket on July 12th. The site consisted of 12 acres with House, Barn, Stable, Shippon (cattle shed) and other outbuildings together with a pew in the church. 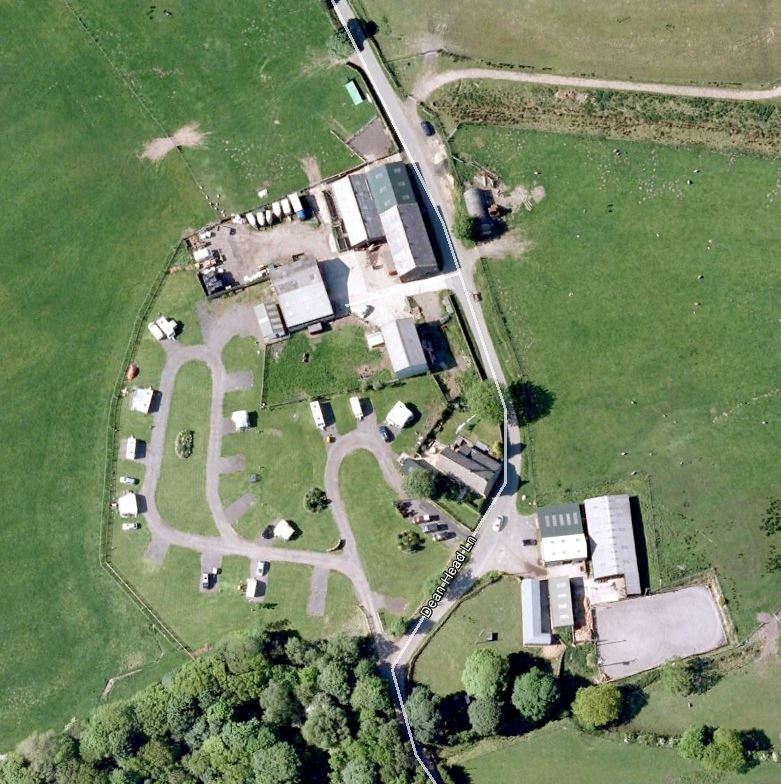 Two farms and a toll booth exist currently as a prosperous campsite. The last tenant was a William Guest. 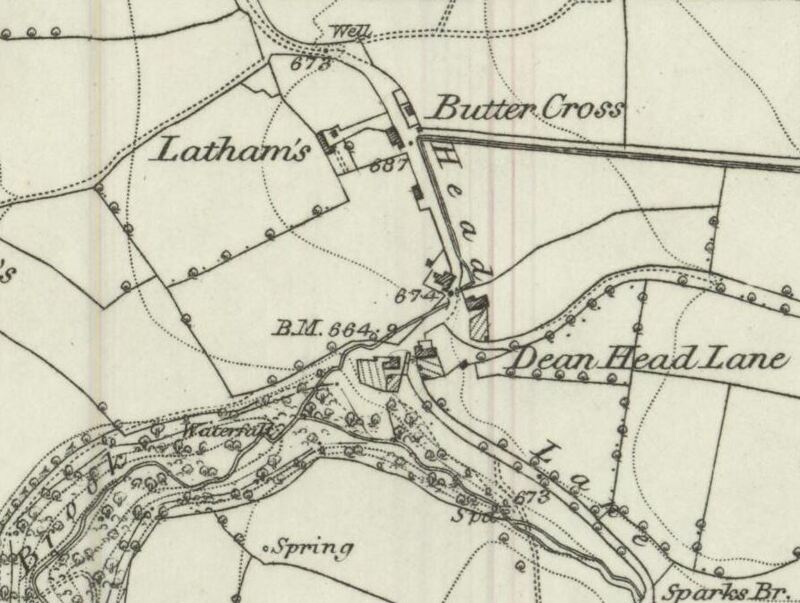 Original mapping also shows a site called Butter Cross which I must investigate. Latham’s, incorporated into the grounds of Wilcock’s Farm camp site these days. Latham’s farm barn now forms part of the extended site currently occupied by Wilcock’s Farm. In 1869, a Thomas Latham went with others to Rivington Hall to assist with the threshing of corn. Whilst fixing a plank, the machine started up and he was trapped by the leg. His leg had to be amputated on 17th November, and he died on 1st December. It could be reasonably surmised that Thomas Latham was from Latham’s Farm, but this too needs further investigation. Wilcock’s, Latham’s and Butter Cross grounds are all visible here. The camp site is small but popular. This is in raised characters, but incised between the letters and date is that date 1863. The belt of ruins around Turners. According to George Birtill, the 1670 datestone had the initials for a Robert and Elizabeth Foster – which almost ties in with the above, and there were local records for Fosters in the Commonwealth Survey of 1650. The property was extended some time one hundred or so years ago, it is believed, with one part higher than the rest, and this stuck out into the road. Birtill surmises that this abutment was a Toll House, added on by a Wilcock. I say that the barn was by a Wilcock, going off the date stone above. Anyway, the presence of the Toll House is certainly likely. There is evidence across the road where a stone trough lies, this was believed to be a place for one’s horse to drink whilst you paid the toll. There was another gory story of the moors just over 40 years later. 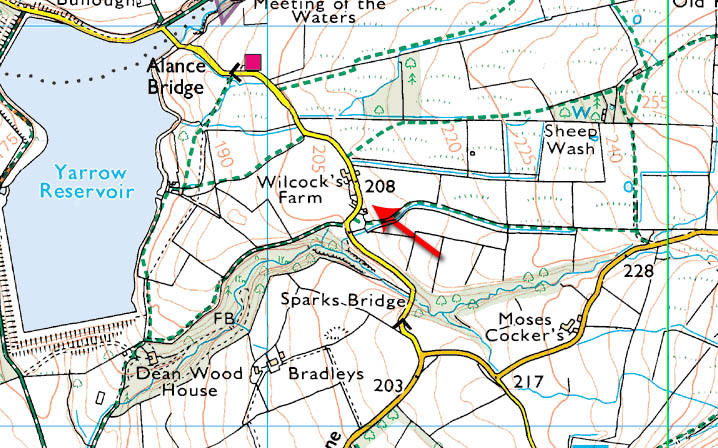 On 13th July, 1912, a James Carr was walking to Wilcock’s Farm. His body was found at the bottom of a steep embankment in nearby Dean Wood by James Farnworth, a painter from Mill Hill, Rivington, James Carr was 68 years old at the time of his death. He was a member of the bowling club, and Edward Berry the postmaster had known him for about 30 years. The deceased had fallen about forty foot down the embankment, which was at the side of an unfenced path. He fractured his right thigh and left ribs, suffered shock and died of bronchitis. Unsurprisingly, the path was then fenced. Twelve years after this incident, the owner was a William Blackmore. The current owners are Dave and Julie Wood. 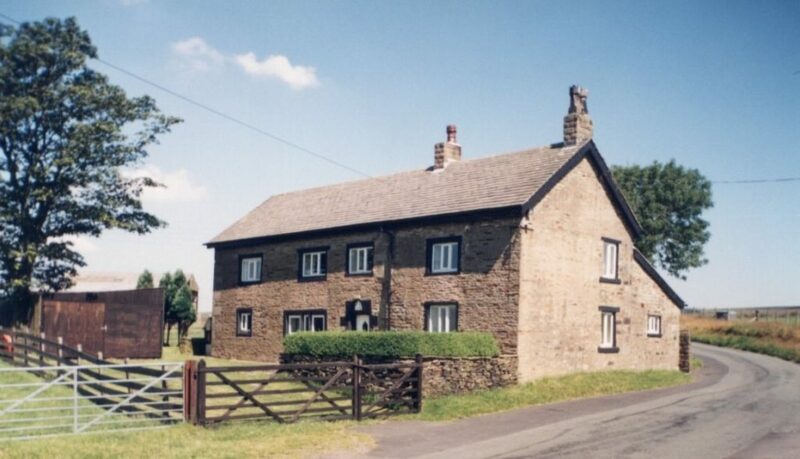 The property is being refurbished during Christmas 2014, and is having mains water plumbed in by United Utilities, along with all remaining moorland farms.